This collar is size MINI. It will be 1/2" wide, and will slide adjust to fit 7 to 11" neck size. 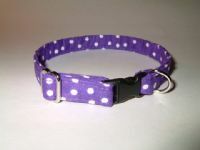 Since the mini collar is the same size as the cat collars it can be made into some of the cat fabrics that are available. This collar is size EXTRA SMALL. It will be 5/8" wide, and will slide adjust to fit 7 to 11" neck size. This collar is size SMALL. It will be 3/4" wide, and will slide adjust to fit 10 TO 15" neck size. This collar is size MEDIUM. It will be 1" wide, and will slide adjust to fit 12 TO 19" neck size. This collar is size LARGE. It will be 1" wide, and will slide adjust to fit 15 TO 24" neck size.